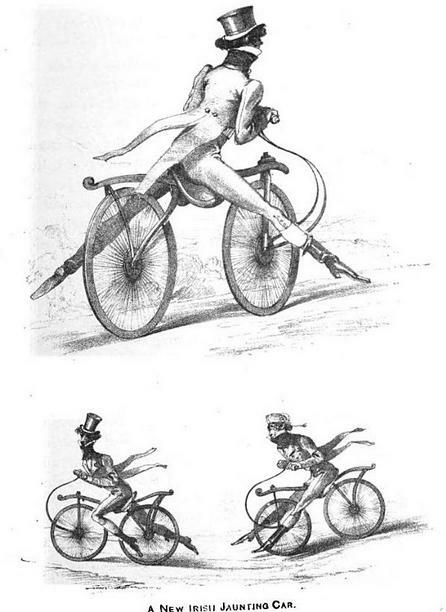 Imagine a bicycle with no brakes and no pedals and you have an idea of what it was like to ride a velocipede, or the dandy horse, in the early 19th century. This meant that the man riding this contraption not only looked ungainly while riding it, but had very little control over what he was doing and where he was going, especially on uneven and hilly ground. Learning how to ride one of these vehicles wasn’t easy. 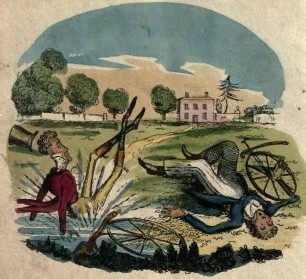 As seen in the image above, a man would propel himself with his legs and brake with them. 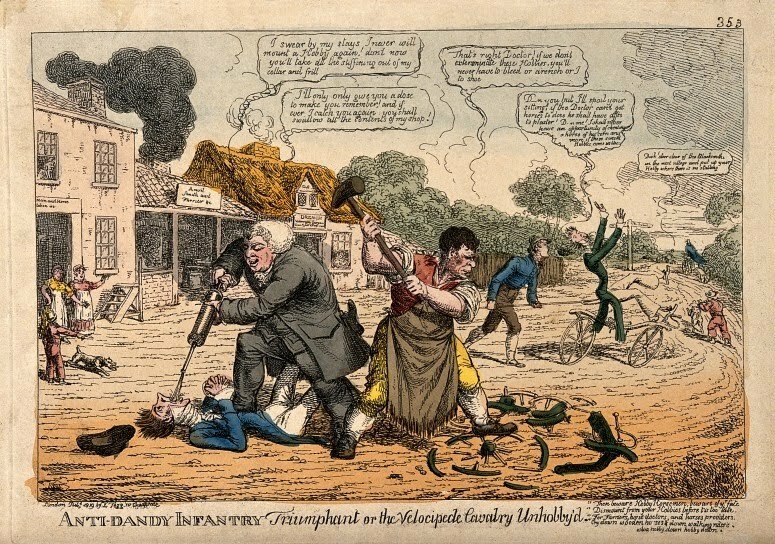 The image below is from the archives of Westminster City Council, and is of a postcard of Dennis Johnson’s (c.1760-1833) velocipede school. The school was founded in 1818 by Johnson, the coachmaker, who had made some improvements on Drais’ machine. He managed to make around 320 of his pedestrian curricles, as he called his patented machines. 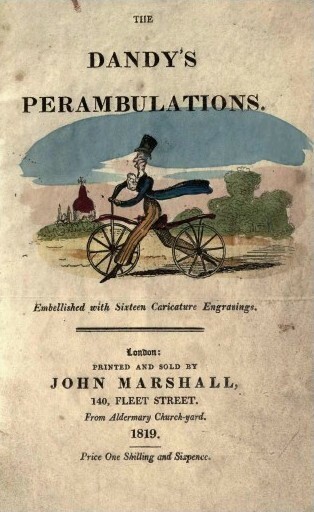 Then in 1819 the craze for velocipedes went out of fashion: Mr. Johnson returned to making carriages. (Velocipedes.) 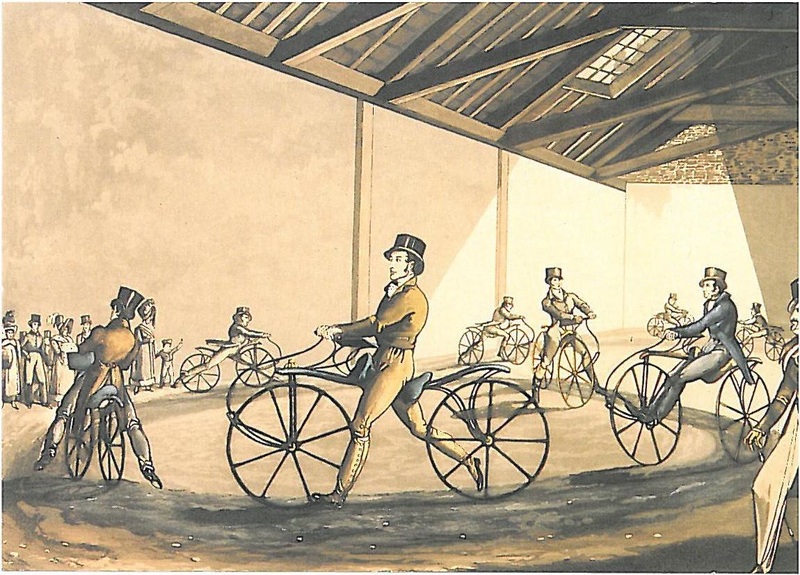 It wasn’t until towards the end of the 19th century that the velocipede began to be perfected and started to resemble the bicycle we know today. Several years back I featured a remarkable publication on Dandyism.net called The Dandy’s Perambulations. The pamphlet was printed and sold in 1819 by John Marshall in Fleet Street. At length in safety reached St. Paul’s. 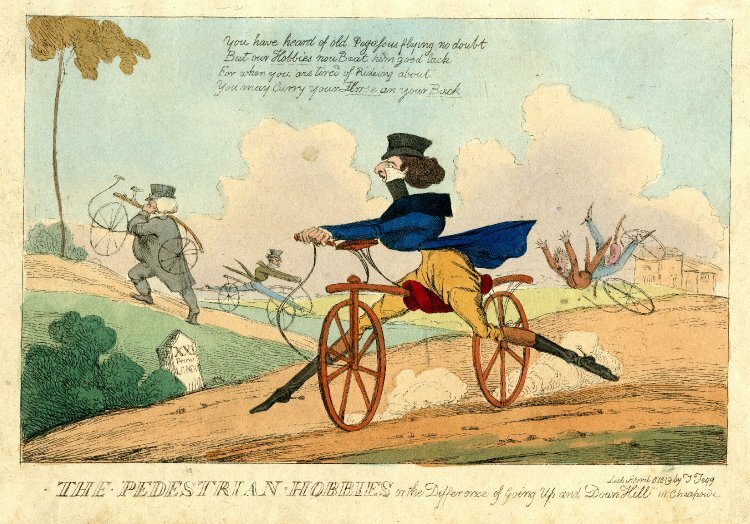 It is sad to think that Jane Austen, who died in 1817, never had the chance to observe a gentleman riding a velocipede. With her wit and keen sense of observation, what would she have made of the sight? Louisa May Alcott in the late 19th c. still acts like the velocipede is a crazy dangerous thing for a young man to want–the way moms talk about motorcycles & their teenaged sons now. What a charming travel to the past! Thank you for giving us a pleasure of reading it. Georgian Gentleman must have looked ridiculous astride these awkward contraptions as they paddled their way down the avenue in all their finery and top hats. I can see why the craze died out quickly. I wonder if any Georgian women ever tried one out. I think even Elisabeth Bennett would have been hard pressed to mount one of these beasts. I am new to these readings. I had almost zero knowledge of velocipedes until reading this article. What a fascinating article. I agree with Barry above, that the dandies must have looked ridiculous while astride them. How did the women not just laugh in gales as they saw them passing by? Karen, one must put oneself in Jane Austen’s shoes (had she lived) and laughed with full gusto! I know I saw one of these in a movie or something recently but I can’t remember what it was. Excellent post! I believe this is the contraption that a character in Georgette Heyer’s “Frederica” was riding, and ended up crashing. It was Frederica’s brother Jessemy, who secretly tried very hard to learn to ride it so that he could impress his family, especially his more adventurous brother Felix. Instead he got into a rather amusing scrape. That’s one of my favorite scenes in Frederica. I was just going to comment on that. Great minds think alike, or rather read alike! A fascinating look at the odd and awkward beginnings of what is today one of the most respected forms of transportation (the bicycle). I knew a smattering of things about velocipedes, but nothing in detail. Thanks for feeding my inner history-trivia geek!